The other day I was hanging out with a good friend and we were chatting about how she’s not super excited about getting in the kitchen. I love to cook so am always a little befuddled when I discover someone who just isn’t into it. While we were having a lovely time hanging out, and watching out tots playing, I decided it was the perfect opportunity for a spontaneous “How to Use Your Slow Cooker” creation. We tossed a few things together that she had hiding in her fridge and freezer, I added a bit of seasoning, and hoped it would be delicious. Yeah, I guess the final result was a bit spicy. 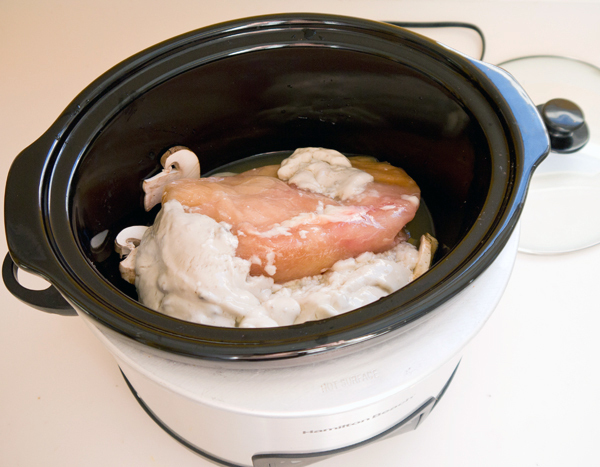 I own a slow cooker but have to admit to not using it very often. I love slowly braise big cuts of meat in Dutch ovens, baking chicken until it has a crispy skin, and quickly searing tasty meats. 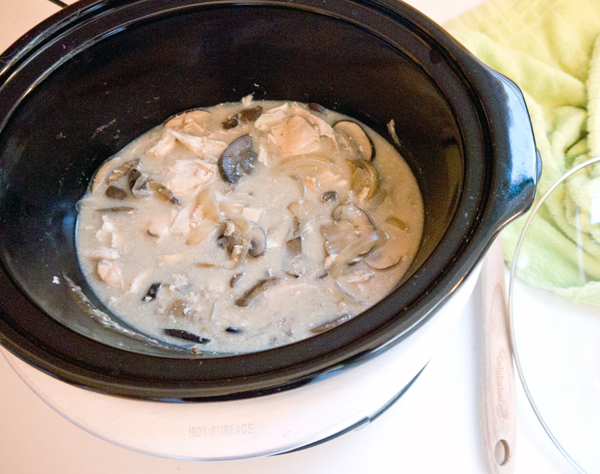 The slow cooker seems like a gooey-ooey mess of shredded and over cooked ingredients. But I was determined to figure it out and put together a wonderfully delicious recipe for my friend. This is seriously easy, takes only a few minutes of morning prep, which makes things wonderfully simple. 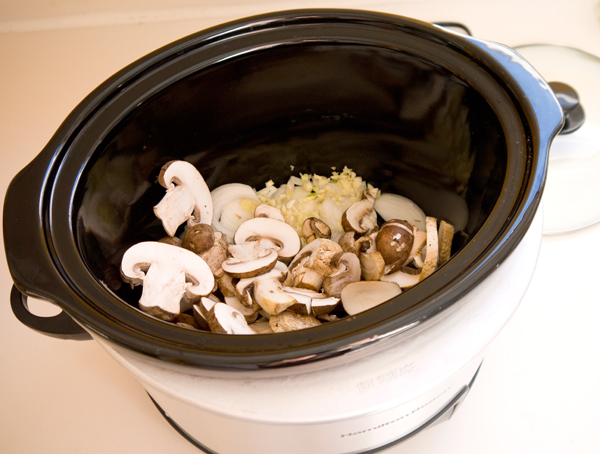 Slice the onion and mushrooms, and chop the garlic, adding them to the slow cooker. Doesn’t matter how you chop or slice the ingredients — the way you do it totally fine. Now you can add the chicken and cover with the soup and chicken stock. That’s really it. Cover and set on low for eight hours. Go to work or do whatever you do. After several hours of simmering away, you’ll have something that looks like this. 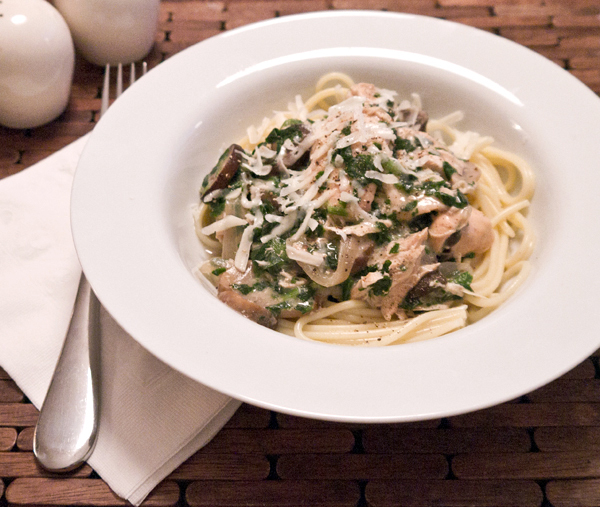 Give things a stir and let simmer while you relax after your long day until you’re ready to eat dinner. 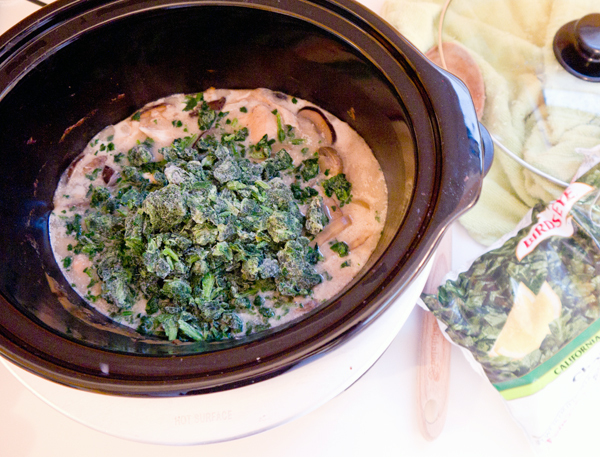 Boil some pasta and add the frozen spinach to the chicken Florentine. By the time your pasta is ready, the spinach will be nice and hot. Place some pasta in the bottom of a bowl, cover with a big ladle of the yummy chicken, and cover with a grating of fresh Parmesan cheese. Dinner is served!